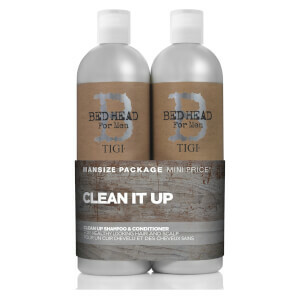 Recharge distressed hair with restored softness and shine with the TIGI Bed Head Moisture Shampoo, Conditioner and Leave in Conditioner Set, a haircare trio for dry, chemically-treated tresses that combines a super-sized reparative shampoo and conditioner duo with a damage-mending leave-in treatment that drenches dry locks in moisture to strengthen strands, protect against damage and replenish lost radiance. Bring damaged locks back to life with a gently cleansing formula for dry hair. The shampoo expertly lifts away dirt, excess oil and product build-up whilst replenishing vital hydration to restore the natural moisture levels that can be unbalanced due to colouring and heat styling. 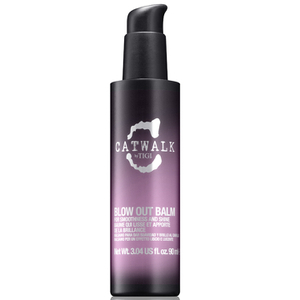 The formula creates a protective barrier over each hair strand, helping to prevent any future damage and leaving locks soft, shiny and full of health. A lightweight leave-in hair treatment with a smooth, milky texture and delectable fruity berry scent that pampers damaged locks and brings them back to life with restored shine and silky-smooth texture. Formulated with Keratin to reduce frizz and improve manageability, it penetrates tresses with a conditioning complex to deeply moisturise and strengthen, leaving hair super-soft and easier to handle for effortless and fuss-free styling. 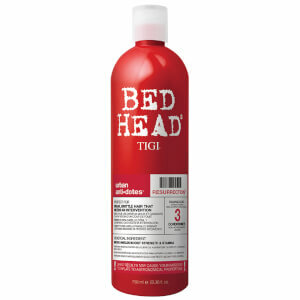 Leave-In Conditioner: Apply sparingly to hair after shampoo. Rub and massage deep into the ends of hair. Do not rinse out. Leave-In Conditioner: Water (Aqua/Eau), Glycerine, Propylene Glycol, Hydrolyzed Keratin, PEG-8 Methicone, Phenyl Trimethicone, Phenoxyethanol, Polyquaternium-10, Guar Hydroxypropyltrimonium Chloride, PVP, Fragrance (Parfum), Cyclopentasiloxane, Disodium EDTA, PEG-4 Dilaurate, PEG-4 Laurate, Citric Acid, Iodopropynyl Butylcarbamate, PEG-4, Amodimethicone, Cetrimonium Chloride, Trideceth-12, Amyl Cinnamal, Benzyl Salicylate, Citronellol, Geraniol, Hexyl Cinnamal, Hydroxycitronellal, Limonene, Linalool, Red 33 (CI 17200).